This think-piece takes the form of snapshots from Peter's journey during the decade 1998-2008 teaching research and other courses for the Critical and Creative Thinking (CCT) Graduate Program at the University of Massachusetts Boston. CCT, despite the “thinking” in its name, is about reflecting on and changing practice. The Program aims to provide its mid-career or career-changing students with “knowledge, tools, experience, and support so they can become constructive, reflective agents of change in education, work, social movements, science, and creative arts” (CCT 2008). In this vein, it seems less important for us to describe the detail of the classroom mechanics and CCT course requirements, than it is to stimulate reflection and dialogue about the challenge of supporting students (and others) to develop as reflective practitioners. Each of the Phases of Research and Engagement is defined by a goal. I (Peter) made the phases and goals explicit after my first semester teaching research and writing to CCT's mid-career graduate students. One student, an experienced teacher, had dutifully submitted assignments, such as the Annotated Bibliography, all the time expressing skepticism that this course was teaching her anything new: “I have already taken research courses and know how to do research papers.” Indeed, I felt that most of her submissions did not help move her project forward; the form was there, but not the substance. I often asked her to revise and resubmit, emphasizing that the point was not to complete, say, the annotated bibliography just because I, the instructor, deemed this an essential part of a research project. The point was for her to do the annotated bibliography in a way that brought her closer to being able to say “I know what others have done before, either in the form of writing or action, that informs and connects with my project, and I know what others are doing now.” By the end of the semester I had made such goals and the corresponding Phases an explicit organizing structure for the course and other research projects. The resistance of this student had given me an invaluable push to rework my own syllabus. A colleague in the same faculty seminar on teacher research participated in the first class of the research and writing course as if he were a student. The class consisted of: an overview of the phases from me; a Q&A session with a student from the previous year's class (during which I was absent from the room); and some Freewriting, rough drafting, and peer sharing of an initial project description. The colleague, Emmett Schaeffer, commented afterwards on the oscillation the students faced between opening wide and focusing in. He also noted that the students were somewhat “dazed” about how much was opened up and put in play during this first session (Box 1). As my thank you email expressed (Box 2), having someone else see what was going on helped me articulate and own a tension that runs through most of my teaching. both to others and their opinions, but also to one's “divergent” (from one's conscious, explicitly formulated path) thinking, feeling, etc. → what about students being “dazed,” “overwhelmed” and “confused”? (and reflecting on the doing that requires some doing). I really appreciate your keen observations and the work you did in synthesizing them into the notes. What we did together was rare and special--I could only remember one other time I got a colleague's observations that affirmed but also helped me articulate and own what I was doing. That time was an ESL -Spanish teacher who had asked to visit a class of mine about biology and society. She noted my comfortable use of ambiguity. Much followed for me from her naming this. In fact, I suspect that the affirmation-articulation connection is a key to the observed person doing something productive with the observations. The same observation about having to move between opening out and focusing in was made independently a few years later by a student, herself an experienced college teacher, when she summarized the experience of the course on evaluation and action research. Snapshots 1 to 3 have not mentioned that course, but it was evolving at the same time as the course on research and writing. When I first took over teaching this second course, the title and emphasis was educational evaluation. I soon had this changed to evaluation of educational change so as to clarify that it was not about assessment of student assignments. Moreover, to meet the needs of the diverse, mid-career professionals and creative artists that enter CCT, “educational change” had to be construed broadly to include organizational change, training, and personal development, as well as curricular and school change. The revised title still missed the central motivation for the course in the CCT curriculum, which was: “If you have good ideas, how do you get others to adopt or adapt them?” Put in other words: “How do you build a constituency around your idea?” This concern can lead researchers into evaluating how good the ideas actually are (with respect to some defined objectives) so they can demonstrate this to others. It can also lead a researcher to work with others to develop the idea so it becomes theirs as well and thus something they are invested in. Taking an individual who wants “to do something to change the current situation, that is, to take action” as the starting point, Action Research became the central thread. The course title was eventually changed again to reflect this emphasis: “Action Research for Educational, Professional and Personal Change.” The Cycles and Epicycles of Action Research model that emerged made room for group facilitation, participatory planning, and reflective practice, as well as for systematic evaluation. The next two snapshots touch on group processes; the one after links the research side of Action Research to Project-Based Learning. My own research during the 1980s and 1990s focused on the complexity of ecological or environmental situations and of the social situations in which the environmental research is undertaken (Taylor 2005). Since the 1990s collaboration has become a dominant concern in environmental planning and management, although the need to organize collaborative environmental research can be traced back at least into the 1960s (Taylor et al. 2011). Collaboration is self-consciously organized through the frequent use of workshops and other “organized multi-person collaborative processes” (OMPCPs). I started to try to make more sense of the workshop form after participating during the first half of 2000 in four innovative, interdisciplinary workshops primarily in the environmental arena (Taylor 2001). Two ideals against which I assessed these workshops were that group processes can: a) result in collaborators' investment in the product of the processes; and b) ensure that knowledge generated is greater than any single collaborator or sum of collaborators came in with (see discussion of strategic participatory planning in the think-piece on Action Research and Participation). As a postscript to my analysis of why a workshop (or OMPCP) might be needed to address the complexity of environmental issues, I assembled a list of guidelines or heuristics about making workshops in general work. The results of the first two steps are given in Box 3. The questions in the third step were generated by CogniSystem software that analyzed my responses and then arranged the conditions in a “structural model” from “deep” to “top,” where deeper conditions are helpful for the ones above them. the knowledge is applied and has significance. 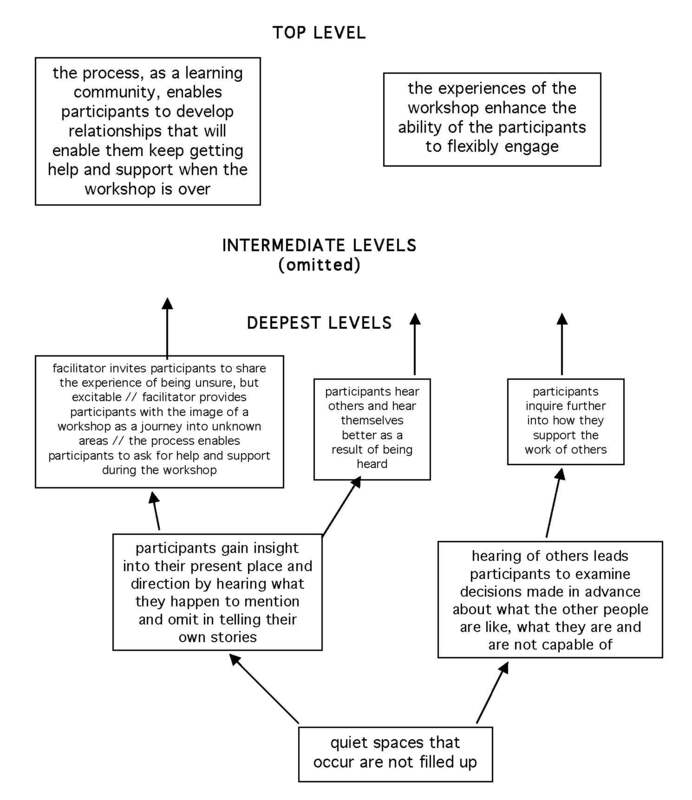 ii) participants' subsequent work enhances the capacity of others to flexibly engage, that is, to connect with people who are able to take initiative—or are almost able to—in forming communities of practice/change collaborations that provide their participants experiences that enhance their ability to flexibly engage. It brings to the surface knowledge of the participants that they were not able, at first, to acknowledge. Participants get to know more about each others' not-yet-stable aspects. Quiet spaces that occur are not filled up. participants recognize that there is insight in every response. The facilitator invites participants to share the experience of being unsure, but excitable. Participants gain insight into their present place and direction by hearing what they happen to mention and omit in telling their own stories. Participants hear others and hear themselves better as a result of being heard. This hearing of others leads participants to examine decisions made in advance about what the other people are like, what they are and are not capable of. Participants inquire further on the issues that arise in their own projects. Participants inquire further into how they support the work of others. Participants' energies are mobilized by the process. There is a wide range of participants, not only technically expert participants. The plans allow for individual participants to select and focus on a subset of the workshop-generated specific plans or knowledge in their subsequent work. The process, as a learning community, enables participants to ask for help and support during the workshop. The process, as a learning community, enables participants to develop relationships that will enable them keep getting help and support when the workshop is over. Participants find opportunities to affirm what is working well. The reflection on each phase leads to one concrete product to take into next phase. The experiences of the workshop enhance the ability of the participants to flexibly engage. Group processes not only need skillful and effective facilitators; they also need participants or collaborators who are skilled and effective in contributing to the desired outcomes (see Cultivating Collaborators think-piece). To develop skills and dispositions of collaboration requires researchers (and researchers-in-training) to make opportunities for practicing what they have been introduced to and to persist even when they encounter resistance. What moves them to pursue such development? I have had an opportunity since 2004 to address this issue through an annual series of experimental, interaction-intensive, interdisciplinary workshops “to foster collaboration among those who teach, study, and engage with the public about scientific developments and social change.” The workshops are documented in detail on their websites (NewSSC 2018), but a thumbnail sketch would be: They are small, with international, interdisciplinary participants of mixed rank (i.e., from graduate students to professors). There is no delivery of papers. Instead participants lead each other in activities, designed before or developed during the workshops, that can be adapted to college classrooms and other contexts. They also participate in group processes that are regular features of the workshops and are offered as models or tools to be adapted or adopted in other contexts. The themes vary from year to year, but each workshop lasts four days and moves through four broad, overlapping phases: exposing diverse points of potential interaction; focusing on detailed case study; activities to engage participants in each others' projects; and taking stock. The informal and guided opportunities to reflect on hopes and experiences during the workshop produce feedback that shapes the unfolding program as well as changes in the design of subsequent workshops. 1. Respect. The small number and mixed composition of the workshop participants means that participants have repeated exchanges with those who differ from them. Many group processes promote listening to others and provide the experience of being listened to. Participation in the activities emphasizes that each participant, regardless of background or previous experience has something valuable to contribute to the process and outcomes. In these and other ways, respect is not simply stated as a ground rule, but is enacted. 2. Risk. Respect creates a space with enough safety for participants to take risks of various kinds, such as, speaking personally during the autobiographical introductions, taking an interest in points of view distant in terms of discipline and experience, participating—sometimes quite playfully—during unfamiliar processes, and staying with the process as the workshop unfolds or “self-organizes” without an explicit agreement on where it is headed and without certainty about how to achieve desired outcomes. 4. Re-engagement. Respect, risk, and revelation combine so that participants' “gears” engage. This allows them to sustain quite a high level of energy throughout the workshop and engage actively with others. Equally important, participants are reminded of their aspirations to work in supportive communities—thus, the prefix re-engage. Participants say they discover new possibilities for working with others on ideas related to the workshop topic. In contrast to the step-by-step progression in most accounts of action research, the Cycles and Epicycles of Action Research model (see Part 1) allows for extensive reflection and dialogue. This is essential not only for constituency-building, but also for problem-finding, that is, for ongoing rethinking of the nature of the situation and the actions appropriate to improving it. In this sense Action Research mirrors Project- or Problem-Based Learning (PBL), at least the kind of PBL that begins from a scenario in which the problems are not well defined (Greenwald 2000). Stimulated by the work of my CCT colleague, Nina Greenwald, I began to introduce a PBL approach in the evaluation course which led it evolve into an Action Research course. I then brought PBL into other courses on science in its social context. The way I have come to teach with PBL is summarized in Box 5 (updated in Project-Based Learning and Taylor 2015, which includes links to examples of PBL scenarios and student work). increased motivation for subsequent, more-focused inquiry (see “inverted pedagogy” below). Interdisciplinary Coaching: The instructors facilitate the brainstorming and student-to-student exchange and support, coach the students in their individual tasks, and serve as resource persons by providing contacts and reading suggestions drawn from their longstanding interdisciplinary work and experience. KAQF framework for inquiry and exchange: This asks students to organize their thinking and research with an eye on what someone might do, propose, or plan on the basis of the results (i.e., A for action on the basis of K for knowledge), presumably actions that address the objective stated in the PBL scenario. Internet facilitation: The internet makes it easier to explore strands of inquiry beyond any well-packaged sequence of canonical readings, to make rapid connections with experts and other informants, and to develop evolving archives of materials and resources that can be built on by future classes and others. PBL was enthusiastically pursued by one CCT student and led to her transformation from community-college librarian with no science background to participant in campaigns around health disparities and employment as a research assistant in the biomedical area. Although I will not tell her story here, it moves me to recount some earlier reflections on students' development in the CCT Program as a whole, which make up the last two snapshots. When the CCT graduate program was moved under a Department of Curriculum and Instruction, I decided to learn more about the theory that guided that field. I came across William Doll's account of postmodern curriculum design, which centers on his “4Rs”: richness, recursion, relation, and rigor (Doll 1993). My immediate response was that Doll's Rs do not capture a lot of what goes into CCT students' mid-career personal and professional development. I soon had twelve Rs, and then more. The figure below took shape as I played with ways to convey that some Rs will make limited sense until more basic Rs have been internalised and that periods of opening out alternate with periods of consolidating experiences to date. 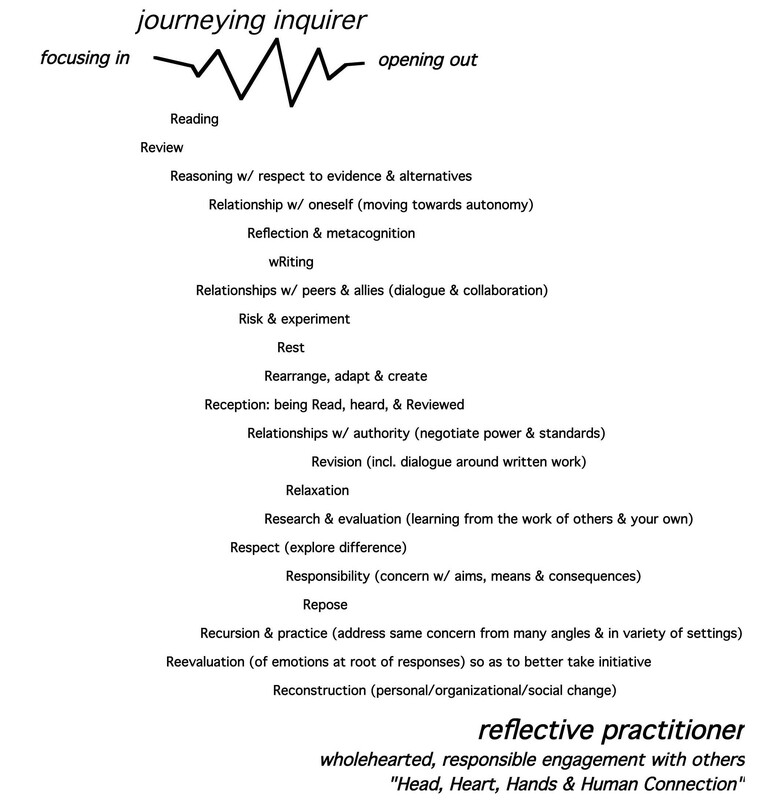 The Many Rs schema evokes the windy and less-than-direct flow of my own development as a teacher and facilitator of research and engagement as captured in these snapshots. CCT (Critical and Creative Thinking Program) (2008). “Overview.” http://www.cct.umb.edu/overview.html (viewed 2 Sep 2008). Critical Thinking Across The Curriculum Project (1996). “Definitions of Critical Thinking.” http://www.kcmetro.cc.mo.us/longview/ctac/definitions.htm (viewed 18 Feb 2001). Doll, W. E. (1993). A Post-Modern Perspective on Curriculum. New York, Teachers College Press. Ennis, R. H. (1987). “A taxonomy of critical thinking dispositions and abilities.” Pp. 28-32 in Baron, J.B. and Sternberg, R.J. (eds.) Teaching Thinking Skills: Theory and Practice. New York: W. H. Freeman. Greenwald, N. (2000). “Learning from Problems.” The Science Teacher 67(April): 28-32. NewSSC (New England Workshop on Science and Social Change) (2018). “Links to webpages and associated materials for all workshops.” http://www.stv.umb.edu/newssc.html (viewed 28 Aug 2018). Taylor, P. J. (1999). “From 'dialogue around written work' to 'taking initiative'.” http://www.faculty.umb.edu/peter_taylor/citreport.html (viewed 28 Aug 2008). Taylor, P. J. (2001). “Generating environmental knowledge and inquiry through workshop processes.” Working Papers on Science in a Changing World, no. 6. https://scholarworks.umb.edu/cct_sicw/6 (viewed 22 Oct 2018). Taylor, P. J. (2005). Unruly Complexity: Ecology, Interpretation, Engagement. Chicago, University of Chicago Press. Taylor, P. J. (2008). “Developing Critical Thinking is Like a Journey.” Pp. 155-169 in G. F. Ollington (ed.) Teachers and Teaching Strategies, Problems and Innovations. Hauppauge, NY: Nova Science Publishers. Wiggins, G. P. and J. McTighe (2005). Understanding by Design. Alexandria, VA: Association for Supervision and Curriculum Development.